While the stainless steel cool of many modern Italian restaurants has left no place for a little background music to ease diners into the welcoming embrace of the evening’s culinary delights both at home and in the more old fashioned outposts of Italian cooking opened by emigrants and their descendants across the world, it is still possible to make out the often mournful notes of a mandolin above the pre-prandial chatter of the customers. One of the favoured signature tunes of the trattoria is the tarantella, and one that calls for a more vibrant input from the mandolin. The music and the accompanying dance take their name from the southern town of Taranto and are based on the old myth that the only way to survive the bite of a tarantula spider is to indulge in a spot of frenetic activity. 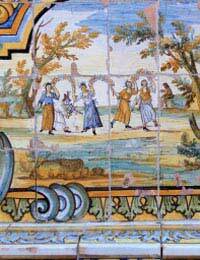 As such the dance is designed to speed up and change direction, and is popular at traditional Italian weddings. As with much of Italian cuisine, there are regional variations of this southern classic, so a Neapolitan’s tarantella is not going to find the same flavour with a Calabrian or Sicilian, all of whom will swear that their version is the superior one. But like chilli pepper, it should be used sparingly: at a discreet volume, the music is pleasing enough; any louder and there is the risk of giving diners indigestion. The tarantella also gets a name check in Mambo Italiano, originally written in the 1950s and based on an old folk song. There have been a number of versions of this cult classic recorded, but the original by Rosemary Clooney (aunt of George, for the record) remains the best. It is included on the soundtrack of the 1996 film Big Night, co-written and co-directed by its star, the Italian-American Stanley Tucci, which tells the story of two brothers and their struggle to save their restaurant in New Jersey. Tucci’s character, Secondo, is all for giving the customers what they want while his brother Primo is determined to stick to the principles of Italian cooking without compromise. The film’s bitter-sweet notes are reflected in the music, which includes songs by Claudio Villa and Matteo Salvatore, and the CD is a must for hosts in search of a musical solution to make their domestic Italian dining experience a success. Other artists worth considering are Adriano Celentano and Gianni Morandi, both of whom are legends of Italian popular music over the past 35 years, and both of whom have won the San Remo festival, the annual celebration of Italian music held in the Ligurian resort. The renaissance of opera classics at the start of the 1990s, driven in part by the football World Cup, may have brought the works of Pavarotti and co to a new audience, but when choosing the evening’s musical entertainment, it is probably advisable to avoid anything from this genre. After all, who wants to tuck into their sorbetto or zabaglione with the climactic notes of Nessun Dorma ringing in their ears?